For those of you who may have seen James Ramsden’s slightly hyperbolic (initially at least) article on Taste of London, the event does require guests to be prepared to pay for Michelin quality food, however the charm of the festival is missed. The unique charm of Taste of London’s is its ability to provide a huge selection of stonkingly good food within a fascinating environment. Guests aren’t required to stand on the spot whilst eating their food, the more adventurous of you will want to walk and eat! Guests have the unique ability to walk between different cultures, fusions and a heap of Michelin stars. I myself quite appreciated eating a fried dim-sum platter from Michelin starred Yauatcha whilst strolling past Launceston Place debating whether or not to have a rice pudding souffle and raspberry sauce (for two) after. 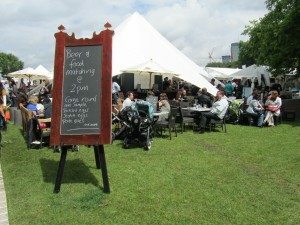 However Taste of London isn’t limited to a list of famous restaurants to provide your culinary delights, there’s a wealth of local sellers located within the marquees’ who’ll be more than happy for you to sample their produce. 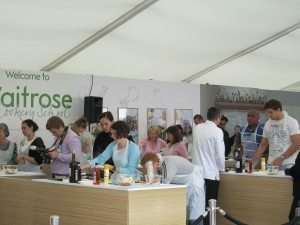 We found ourselves surprised once again by the quality and range of offerings available, and of particular note was the saffron and garlic mayonnaise and the Moscow Mule served at the Wales True Taste Pavilion using Welsh vodka and ginger beer. There was plenty more to do at Taste of London besides eating though. Guests can get involved themselves by pre-booking cookery classes with some of London’s top chefs guiding groups through creating some interesting dishes, whilst in the AEG Taste Theatre guests could watch chefs cooking up several storms. My favourite spot however was chilling out after one too many food samples in the Young’s Brewery tent. After taking a seat on the sofa we found we’d unwittingly sat down to the start of a food and beer matching session with pork pies and pickled eggs! 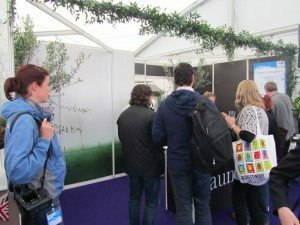 Taste of London is a unique experience, providing guests with a food lovers heaven. You’ll be able to buy new and exciting food outside of the normal supermarket experience, where the atmosphere is welcoming and the exhibitors will love to talk to you and get your views as well as share some very interesting stories on how they got started. Taste of London Corporate Hospitality is available in The Secret Garden: a fabulous opportunity for corporate entertainment, offering guests an exclusive dining opportunity with five chefs collaborating to create a very special five course menu with a personal introduction from each chef to their course.